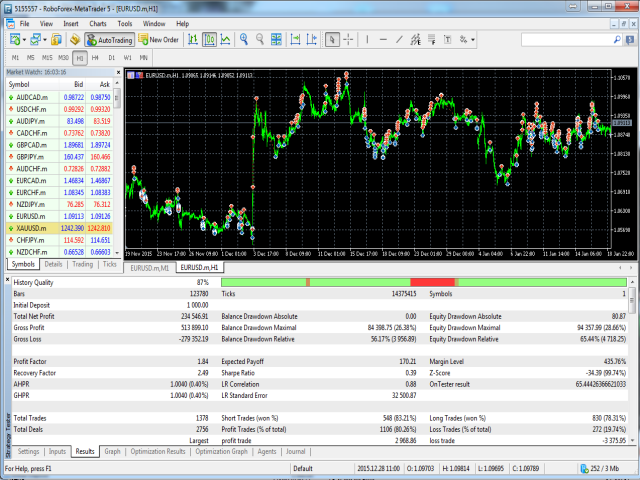 MetaTrader 5 is an absolutely convenient and user-friendly platform. You can use MetaTrader 5 for numerous trading purposes, starting from setting orders to deep analysis and copying trades. All the application’s commands can be found in the main menu, while the most frequently used ones are always present in the user’s toolbar. An easy-to-use Navigator can help you to perform both algorithmic trading and technical analysis. Market Watch contains all the information about your quotes. How to use MetaTrader 5 effectively? All the program’s features and options can be found in the main menu. Here you can perform numerous operations with all kinds of charts, various analytical tools, as well as platform settings. Chart is the key tool for studying the changes in price using numerous analytical objects and financial instruments. You can customize them for almost any purposes, since the platform has a rich chart’s functionality. The MT5 main toolbar consists of 3 mini toolbars: Periodicity, Line Studies and Standard. This menu is customizable, so you are free to add here any most frequently used utilities. Another highly demanded feature is Market Watch. It contains the information about the price of the needed financial instruments, such as statistics, prices and tick charts. Navigator is a favorite feature of hundreds experienced traders. It enables users to switch between different accounts, as well as to use trading indicators and robots. Toolbox contains dozens of minor options, such as account history, financial news, mailbox, alerts and others. How to make the first trade in MetaTrader 5? 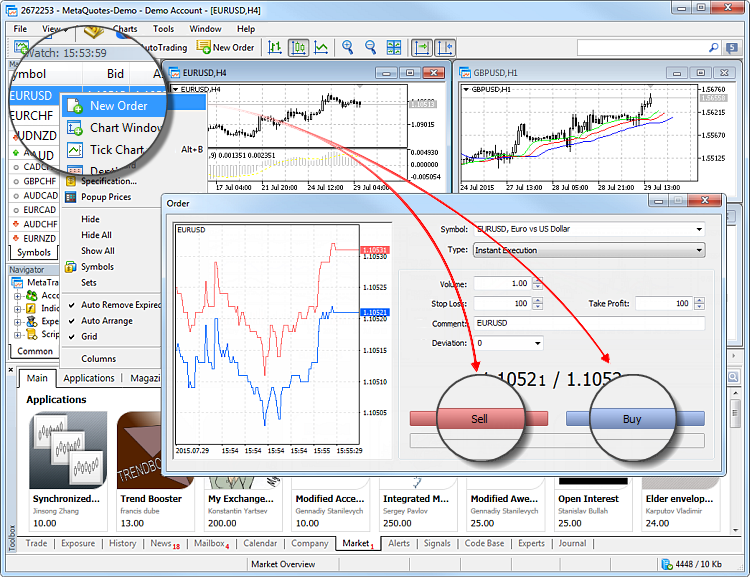 An ability to open a trade is a core of any trading software. To start working on foreign exchange markets, you will need to open a new trade and then start using all the other app’s features. Below is a brief manual on how to open a new trade in the demo account ofMT5 trading platform. Choose a needed financial instrument in the Market Watch window. Then open it with right click and choose "New Order"
If you want to perform a Sell trade, then click "Sell". For a Buy trading purposes choose "Buy". That’s all you need to create a new trade. Simple as 1-2-3! There are plenty of MT5 additional opportunities that can be useful for effective work on the markets. Signals: you can automatically copy trades of experienced traders directly to your account. Subscribe to professionals in a few clicks! Market: Find free and paid technical indicators, trading robots and thousands of other useful tools. Virtual Hosting: rent a virtual hosting right from MT5 to launch your trading robot or to copy signals. Freelance: if you cannot find the needed app in the Market or Code Base, order one from a developer in the following section of MQL5 community. 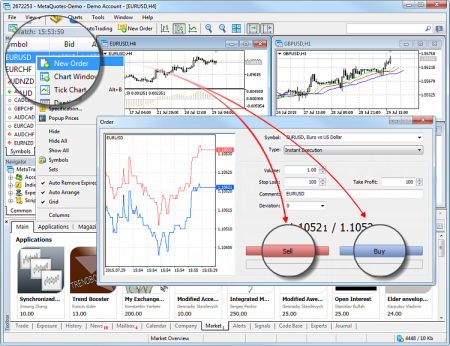 Try to use MetaTrader 5 and dive into the world of amazing trading possibilities right now!